Apparently our adventurous spirit reigns supreme in post-Apocalyptic Texas, as we've decided to go ahead and mosey (you're required by law to mosey instead of walk in Texas, despite the heretic "Walker", Texas Ranger) into Denton to see what's behind the plume of exhaust we spied. This is the way the world ends, not with a bang but a Denton. In our last episode, our post-Apocalyptic road warrior took shelter behind his massive V-8 (the car, not the drink, because that would not be very effective, now would it?) and was deciding whether to leap behind the wheel or dash into the store to join Long Jake and his damsel in distress. I don't know yet whether Long Jake is in a dress, though that would be a nice bit of symmetry. In the drugstore! I hope one of our choices is to ask him to pick us up some candy bars. 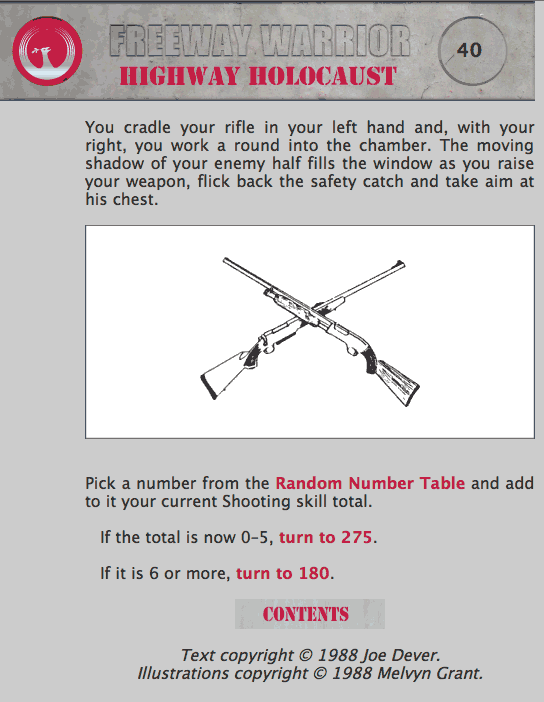 Now, we have a choice here, but I figured from the responses last time that you all were game to be aggressive in an attempt to rescue our cohorts, so I made a command call and decided that if we weren't meant to fire this rifle, it wouldn't be clutched in our cold, dead hands. Or something. WE RULE! One shot, POW, right through the heart. Take THAT, Mel Gibson! And I'm pretty sure we did it without a Samson-like power-mullet. Once again we're left with a directional dilemma. Do we try to join our compatriots in the store and join forces, or do we hop behind the wheel of our Hot Rod Ford and run the bastards down? 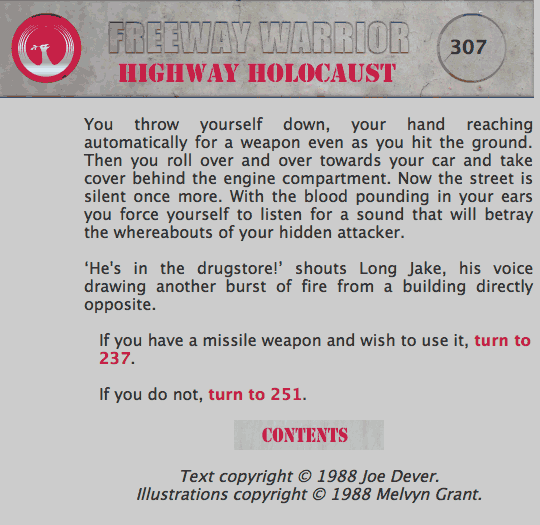 I'm interpreting that second choice as not being "run away" but rather "get to a better fighting location, and/or run some leather-clad punks over." Being a CYOA, however, it could just as easily result in our driving over a cliff to our fiery death. So what'll it be, intrepid survivors? 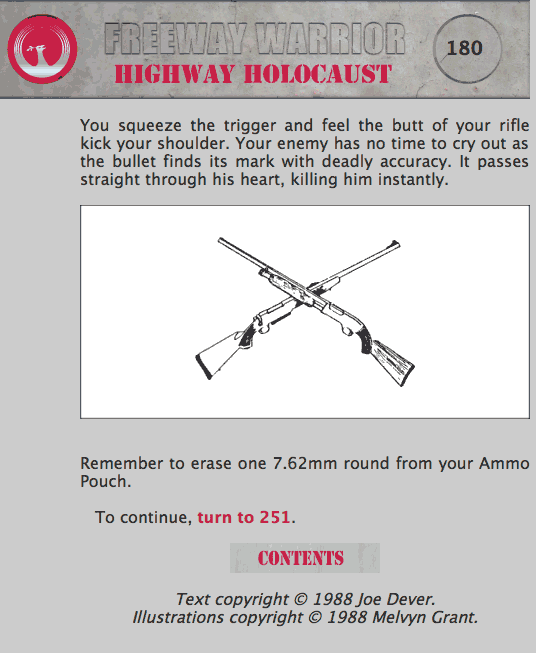 Highway Holocaust Happy Adventure Time GO! 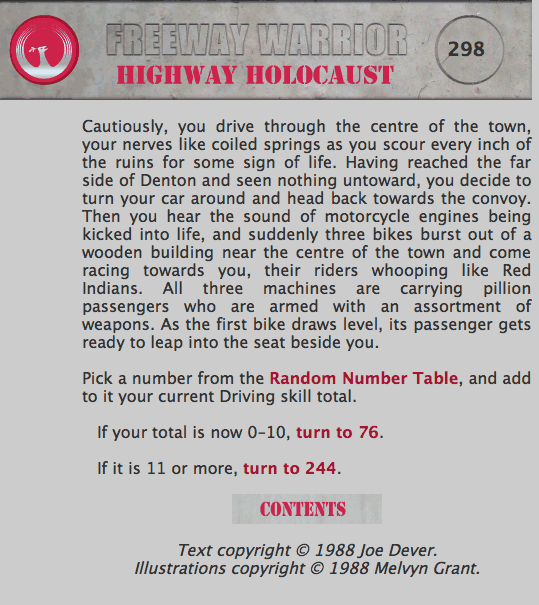 Last week we spent some time deciding what skills and gear our "Freeway Warrior" would sport. We decided to put two points into Shooting, one point into Perception, and one point into Fieldcraft. Being on the wimpy side of the Endurance scale, apparently we thought that it would be better to stay far away from danger by toting a rifle, being smart enough to see trouble coming before it gets close, and wilderness savvy enough to hide if it comes down to it. 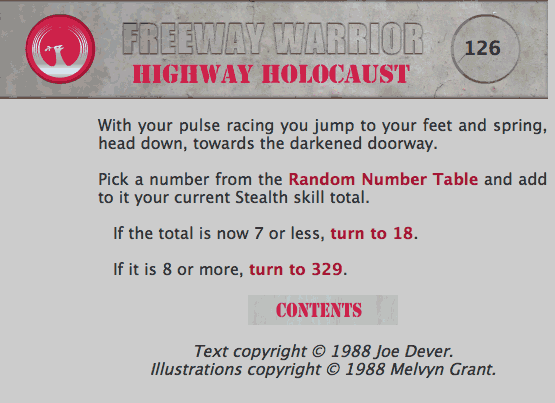 Our new adventure: Highway Holocaust! 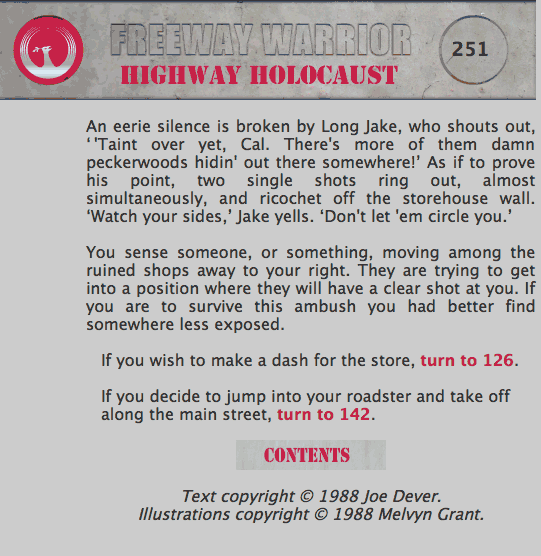 I wanted to try something in a different genre from our Lone Wolf adventures, so I decided we'd go for a post-apocalyptic Road Warrior scenario! Ironically, my wife's last name is Phenix, which is darn close. I'm going to start calling her Freeway Warrior, I think. And we come from Texas! It's fate, I tell you. This adventure comes to us courtesy of the awesome folks at Project Aon. The original material is copyright © 1988 Joe Dever (text) and copyright © 1988 Melvyn Grant (illustrations).